This multi-purpose hardware can be used to panel mount D-sub adapters and connectors. 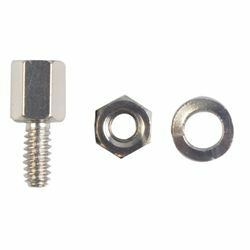 The hex nuts and lock washers are made of steel and nickel-plated. The jackscrews are made of brass and nickel-plated. Sold in packs of 50. They are ideal for serial data transmission, data networks, instrument control and device management.